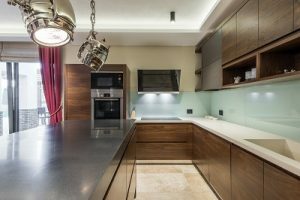 Your kitchen layout is essential to your kitchen remodel. The day has finally arrived: you are ready to remodel your kitchen and create the dream kitchen that you have always desired. When tackling such a monumental project, the last thing you want is to make decisions that you may end up regretting later on. An essential aspect of any kitchen remodel is the layout. It sets the tone for the rest of the kitchen. As such, it’s necessary to know what types of layouts you want to avoid so that you don’t end up with buyer’s remorse. Although your kitchen wish list is likely extensive, make sure that you keep it as realistic as possible. If you plan on installing a kitchen island, make sure that you have the appropriate space that allows for everyone to move freely throughout. Ideally, you want three feet of space around the entire island. A good test to use to make sure there is plenty of room for a kitchen island is to open your dishwasher and make sure that you can easily walk around it. Another appliance that needs space is your fridge, requiring four feet for the doors to open comfortably. One of the most coveted looks for a kitchen, open shelving is a sought after design that many homeowners desire. While the aesthetic is very appealing, you want to avoid open shelving for everyday use. The best way to keep your kitchen looking clean and organized is to keep the open shelving for fancy china and seldom used cookware. It’s essential to give extra thought as to which shelves you want to keep open. Another factor to consider is dust, which can easily accumulate inside your open shelving, especially on a lower shelf. It’s been shown that many kitchen remodels recoup less than 70% of value when you sell your home. But, if you plan on staying in your home forever and are adamant about having a high-end luxe, chef’s kitchen, equipped with all the state of the art appliances, then feel free to go for it. However, if you are trying to see some financial rewards a few years down the line, avoid making uber-expensive purchases on luxury materials and appliances. This entry was posted on Thursday, January 26th, 2017	at 12:23 pm	. You can follow any responses to this entry through the RSS 2.0	feed. Both comments and pings are currently closed.